Okay, next lets talk about something more advance. 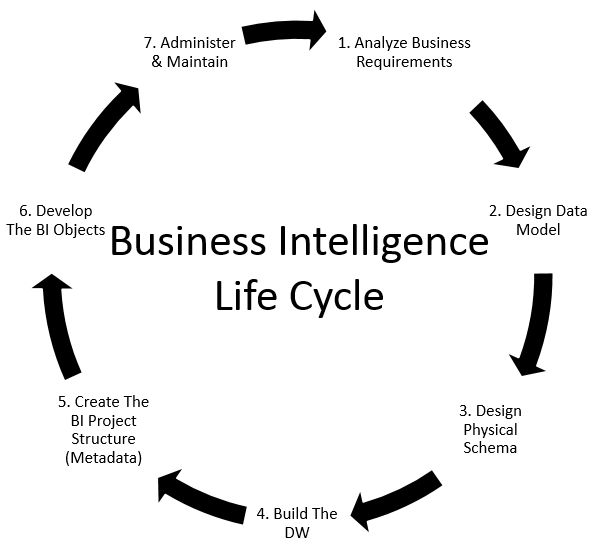 It is about BILC or business intelligence life cycle. Not all company has the BI application in Indonesia. It is quite expensive for them who still struggle to develop or optimize the ERP or core system. If your company planning to start the project, you can see my post here about starting the analytics project and realize the value. One more post is about the BI consultation. Okay, back to the main topic of this post. When we talk about BILC we talk not only about BI, but also about data warehouse (DW) or data mart (DM). It is not necessary but most of the time it will come in pairs as the best practices. Analyze Business Requirements - You review business requirements to determine the types of analysis user need to perform. Design Data Model - Based on the business requirements, design the logical data model, which shows the information that users want to analyze and the relationships that exists within the data. Design the Physical Schema - Using the data model, design the physical schema, which defines the content and structure of the data warehouse. Build the Data Warehouse - Build the data warehouse according to the schema design and load data into the warehouse from source systems. Create the Project Structure (Metadata) - Create the metadata and begin to connect and map the metadata to table in the data warehouse. Develop The BI Objects - Develop object, like attribute, fact, metric, reports and dashboard. Administer and Maintain the Project - Administer and maintain the project as it undergoes continued development and changes, monitor performance and make adjustments to improve it, manage security, and perform other ongoing administrative tasks. The source is from MicroStrategy PDF - Implementing MicroStrategy PDF Version 9.4.1. I think this concept common and can be applied for another BI. I have try this by using another product and it works. There is another common component that is hidden above. It is ETL. Don't forget we have to fill the DW with data from another source system. The DW needed to ensure the data is clean and ready to use by the BI application. So when some customer ask me to directly connect to their OLTP / database it is possible but not the best practices. It depends how you try to use the BI application and what you expect. Thank you for reading. Respon Anda, Pilihan Anda dan Kualitas Diri Anda.